With or without an “eye for form”, it is still possible to distinguish between various scribal hands and forms of script (that is, cursive vs. semicursive vs. standard, etc.). Another way to distinguish scribal technique, script form (cursive vs. semicursive) and individual style, is to simply count up the number of separate strokes that make up each letter. Cursive tendencies produced by various scribal hands lead to varying degrees of cursiveness and, at times, distinctive forms. These forms may be termed as cursive or semi-cursive depending upon the extent to which these tendencies are found. One cursive tendency is to connect consecutive letters without lifting the pen, to form connected writing or ligatures as in the AI of KAI. However, the most common cursive tendency is to execute individual letterforms without lifting the tip of the pen from the writing surface. A letter that might take four strokes in formal or semi-formal script may be inscribed by three or two strokes in a semicursive hand, and by two, or even one, stroke in a cursive hand. 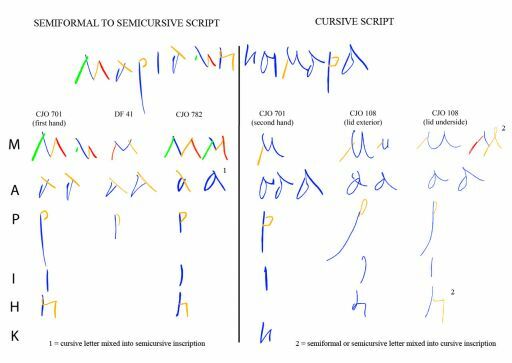 Not all letters of any given script are of equal value when it comes to analyzing the typological character of the “handwriting” of an inscription. The M (mem) is considered a “diagnostic form”, being one of the best for determining the “cursiveness” of a script, since its formal or semiformal form can be formed from four independent strokes with no connection between the letters, while its cursive form, especially in later periods, can be formed by one stroke, and connected to letters on both sides (in “connected writing”). “A” alpha, “H” eta, and “K” kappa are also good diagnostic forms, since the letters vary from a three-stroke form (formal or semiformal script) to a two-stroke form (semicursive script) to a single-stroke form (cursive script). Other letters such as “P” rho (= R) and “I” iota often display little distinction between the semiformal and cursive forms of the script. In all cases, the letters of MAPIAMH display semiformal or semicursive features (four-stroke M’s, two-stroke A’s and H’s), while the letters of KAI MAPA consistently display cursive features (two stoke M’s, one stroke A’s and K). In the case of the letters of the other inscriptions displayed above, although there is a general consistency as to script form (DF 41, CJO 782 = semiformal to semicursive; CJO 108 = cursive), mixture of the various categories of script can happen when the scribe is not being careful. For example, CJO 782, written in semiformal to semicursive script, has one cursive “one-stroke” A. The scribe of CJO 108 who primarily wrote in cursive script, included two formal to semicursive forms of the letters “M” and “H” within words which are otherwise cursive and which include fully cursive forms of M and H. The fact that the first part of inscription CJO 701 MAPIAMH consistently utilizes semiformal to semicursive letter forms, and the last part KAI MAPA consistently uses cursive forms, illustrates the great care the two inscribers/scribes took as they wrote the names in this inscription. If such a single individual wrote the entire inscription, there would almost certainly have been a deliberate consistency manifested throughout.